There are a lot of clubs across the country and around the globe that conduct magic auctions. There are also many online auctions and websites and social media that match buyers and sellers. Some magic conventions even include auctions as part of their schedules. But arguably the largest auction in the U.S. is held in the Spring in Austin, Texas. This boast is backed not only with the attendance (around 300 people) but also with the sales proceeds (last year exceeding over $27,000) and the sheer number of items put up for auction. 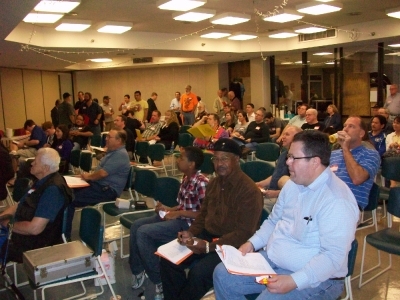 The 33rd annual Austin Auction will be held on Saturday April 5, 2014 but it is more than just a place to bring together buyers and sellers of new and used magic. It is a social gathering that is essentially o magic convention that attracts attendees from across the region and from coast to coast. And the night before always features a special get together of magic collectors who are led by Claude Crowe as they talk about all things that are collectible. And after the auction concludes, many visit the world famous "Esther's Follies" on 6th Street that features my favorite magician, Ray Anderson. Download this podcast in an MP3 file by Clicking Here and then right click to save the file. You can also subscribe to the RSS feed by Clicking Here. (please note: this RSS Feed subscription system may not work with Android systems). Remember, you can download it through iTunes. See the preview page by Clicking Here. Going, going, gone! Lots of stuff will be up for auction at this World Famous Magic Auction. I'm bringin' the gavel. Cheers! I'm sure you want to hear about the big items in the stage auction. So here goes. The first item that sold in the live stage auction was Abbott's "Goofus Plant). Kent got a bid of $60 for that item. Scott Wells then took over and there were four no-sales in the first ten items much to my surprise. The biggest sale was for eight 24" different solid colored Rice silks for $80. Grant Walsh then took the stage and sold the next ten items and included our first $100 sale and a tip of the fez by Scott Wells. It was the coin production trick Copentro. Other sales in this time slot were: Mikame "Heart of Gold" $80, MAK Moxahalla $75, Ultimate Die Penetration $70, and a Silver Nest of Boxes by Laflin $65. David Hira then stepped in for the next ten items and sold two one-hundred dollar items. They were a Rings and Things Chop Cup with accessories that included a second chop cup and Abbott's vintage Hippity Hop Rabbits. He also sold a Grant Double Load Pagoda that was very nice for $85. At 10:15 a.m., about an hour after the auction started, we had sold $1,297 worth of magic from the stage. Other $100 plus items sold from the stage during the morning were: Tommy Wonder's Rubix Card ($100), Full Bloom both volumes by Gaetan Bloom ($120), Unique in All the World - Siegfried & Roy ($500), Gimpy's Cube A Libre ($550), Chaplin's Candle Collectors Workshop ($105), The Oracle Box ($100), The Ultimate Dancing Hank ($775), An Abbott's Classic Production Box ($300), a Viking Nite Club Table ($175), a Twister Illusion ($225), and a Modified Super-X Suspension ($275). The Richard Garriott collection came up next with Brad Henderson doing the demos and David Hira doing the auctioneering. The lowest item went for $30 ( a second Rich Morrotta Mugged and the highest item went for $225 (Ninja Knives - House of Enchantment). There were some nice items here including OMG that brought $100, a Mikame Block and Rope Penetration that sold for $140, and a Lee Alex Happy Birthday Waistcoat (vest) that sold for $95. The Garriott items brought in an estimated $1,910. 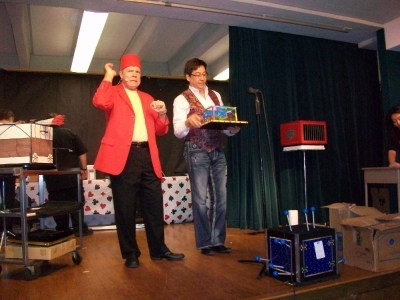 There were several donations to Magic Camp from Steve Wyrick, Murray Sawchuck, Kent Cummins, and other magicians that drew bids. During the afternoon Drag-Gone! ($100), The Gravity Box ($120), Magic -the original book ($300), Wolf Magic Pea Shooter ($125), a Rice 25 foot streamer that was 1 foot in width ($110), MAK Turkish Turmoil ($100), Square Circle ($125), Dr. Chopper's Box ($150), Thayer Double Load Jap Box ($110), Misers Delight ProX - Mark Mason ($125), Framed original Carter Beats the Devil window card ($100), Framed original litho Les Magique Leons half sheet ($200), Epitome Board - Osterlind ($135), and a jumbo mixed bag of coin tricks & effects ($100). I finally dropped out of the stage area around 6:45 p.m. with 9 items to go, so there many have been a couple of other $100 plus items. By the way, after those first four no-sales in the first 15 minutes of the stage auction, there were only eleven no-sales the rest of the day. I'd say 15 of about 250 is a pretty good day. That's why the Austin Magic Auction can say, "If we can't sell your item at our auction, you owe us nothing". Remember, the seller pays only 12% of the final sale price and the buyer pays only what the winning bid is. See you next year! Tagged with Austin Magic Auction, Trixie Bond, David Hira, Grant Walsh, Esther's Follies, Ray Anderson, Texas Collectors, Claude Crowe, Kent Cummins, Ron Cartlidge. March 27, 2014 by Scott Wells. This podcast is totally free for everyone to enjoy. This is provided to you out of love and respect for our art of magic. If you enjoy the podcasts and other material on The Magic Word, then your financial support will be greatly appreciated and help offset the monthly hosting service fee as well as the hardware and software to produce this podcast. Just click on the "Donate " button at the top of this page to make a one time donation through PayPal. You can become a sustaining member by pledging a monthly donation of any amount through "Patreon". Just Click Here for more information on how you can help. By donating to The Magic Word, you will become a "Friend of The Magic Word" and receive a certificate (suitable for framing) indicating your membership plus your name will join your other friends and be posted on our "Wall of Fame". If you prefer to order something from the Store, then that will help support The Magic Word, too. Thank you. In 2018 The Magic Word Podcast was recognized by Feedspot.com as being in the top 75 magic blogs out of the thousands on the internet. We actually landed in position 44,, so really, we were in the top 50! Thank you listeners, for making this happen.